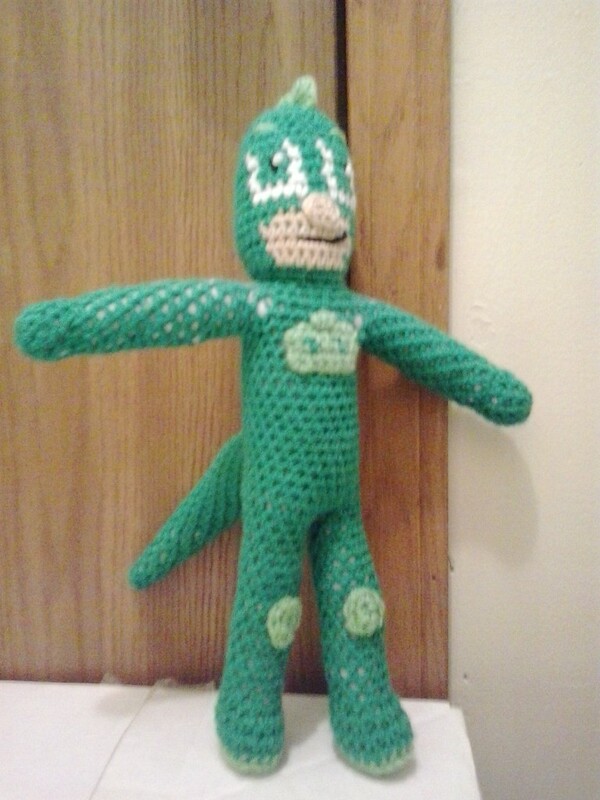 This is an adaptation of my Farrah doll pattern to make Gekko from the PJ Masks television show on Disney channel. These were a request from a co-worker. Worsted weight yarn: Green, buff, white, black, and spring green. Finish off in first LEG. DO NOT FINISH OFF IN SECOND LEG. Rd 1: sc in next 6 sc on SECOND LEG, sc in next 12 sc on FIRST LEG, sc in next 6 sc on SECOND LEG. Rd 3: sc in next 16 sc, holding next sc on BODY and first sc on TAIL together and working through both thicknesses, sc in next 4 sc, sc in next 4 sc on BODY. Rd 4: sc in next 15 sc, sc together the next sc on BODY and first unworked sc on TAIL, working behind TAIL, sc in next sc, ch 2, skip next 2 sc, sc in next sc, skip next 10 sc on TAIL, sc together the next sc on TAIL and next sc on BODY, sc in next 3 sc on BODY. Rd 5: sc in next 15 sc, sc together the next sc on BODY and first unworked sc on TAIL, working behind TAIL, sc in next sc, ch 3, sc in next sc, skip next 8 sc on TAIL, sc together the next sc on TAIL and next sc on BODY, sc in next 3 sc on BODY. Rd 6: sc in next 15 sc, sc together the next sc on BODY and first unworked sc on TAIL, working behind TAIL, sc in next sc, ch 4, sc in next sc, skip next 6 sc on TAIL, sc together the next sc on TAIL and next sc on BODY, sc in next 3 sc on BODY. Rd 7: sc in next 15 sc, sc together the next sc on BODY and first unworked sc on TAIL, working behind TAIL, sc in next sc, ch 3, sc in next sc, skip next 4 sc on TAIL, sc together the next sc on TAIL and next sc on BODY, sc in next 3 sc on BODY. Rd 17: sc in next 2 sc, holding next sc on BODY and first sc on ARM together and working through both thicknesses, sc in next 4 sc, sc in next 8 sc on BODY, holding next sc on BODY and first sc on ARM together and working through both thicknesses, sc in next 4 sc, sc in next 6 sc on BODY. Finish off leaving a long tail. Weave tail through sc of Rd 44, pull tightly and secure. Weave in ends. Using spring green, embroider eyebrows on head. Using black, embroider mouth on head. Using white, embroider white highlights in eyes on head using French knots. Finish off leaving a long tail. Sew NOSE to head of PJ MASKS GEKKO. Rw 1: With spring green, ch 14, slip st in second from hook, (skip next ch, 5 dc in next ch, skip next ch, slip st in next ch) across. Finish off leaving a long tail. Sew MOHAWK to head of PJ MASKS GEKKO. Finish off leaving a long tail. Sew KNEE AND ELBOW PADS to PJ MASKS GEKKO. Rw 5: Ch 1, turn; slip st in next 2 sc, (slip st, ch 1, sc) in next sc, (sc, ch 1, slip st) in next sc. Finish off leaving a long tail. Sew LIZARD LOGO to chest of PJ MASKS GEKKO. PJ Masks and Gekko are copyright Walt Disney Co. and their respective creators.